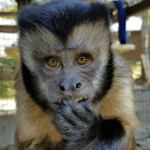 Capuchin’s live throughout a wide range of Central America and South America, as far south as northern Argentina. 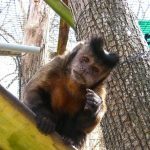 These clever, agile, and powerfully built New World monkeys, who weigh about 3 to 9 pounds, are identified by fur ranging from light tan to dark brown and long, thick prehensile tails, which they use to wrap around branches. In the wild, the foot-and-a-half-tall omnivores typically travel in groups as large as about 3 dozen, foraging for everything from fruits and seeds to insects, birds, lizards, and even small mammals. 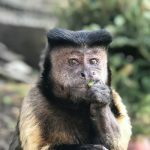 This ongoing search for food is aided by the Capuchin’s rare talent for making and using tools: they use sticks to catch ants and stones to hammer open palm nuts. At night they retreat high into the forest trees, safe from the jaguars below and, with luck, the hawks and harpy eagles who stalk them from above. Cysgo arrived here after having been caged for years without companionship, his only comfort a blanket. Grady, who arrived here in 2000 after having spent years in an individual’s care, is a gifted problem-solver who quickly figures out enrichment puzzles. 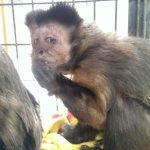 Norman came here after authorities in New York confiscated dozens of neglected and poorly kept animals from a suburban home. Louie is a former pet from Virginia and arrived at the PRC in 2004 at the age of 2. 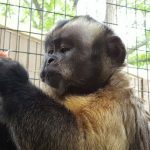 Louie fit in well with our established Capuchin group. Peanut arrived at the PRC after being purchased by an undercover agent during a drug operation in Rowan County Kentucky.